November | 2010 | 50 Westerns From The 50s. 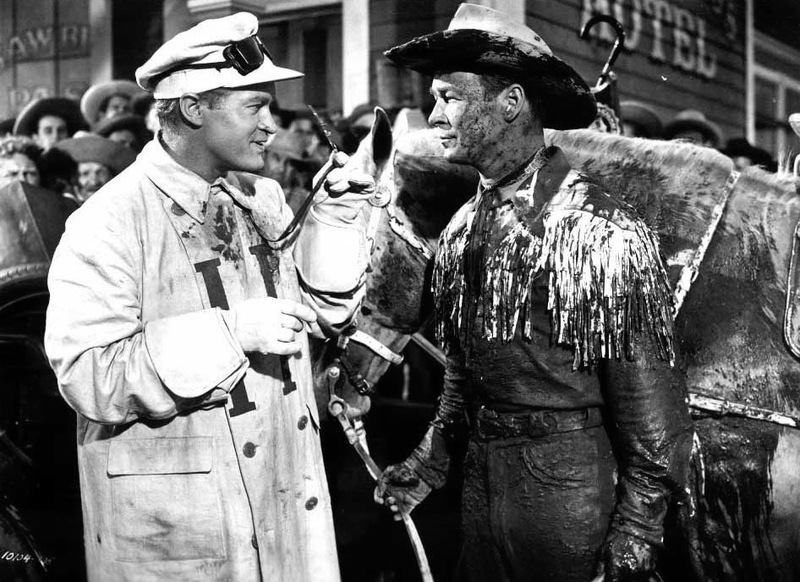 Roy Rogers and Bob Hope. Yesterday, I spoke with Cheryl Rogers-Barnett, daughter of Roy Rogers, about appearing alongside her dad in Trail Of Robin Hood (1950). Son Of Paleface (1952) also came up, and she explained the culture shock of going from Republic to Paramount. Yvonne DeCarlo made a ton of movies at Universal, from Arabian adventure pictures to, of course, Westerns. 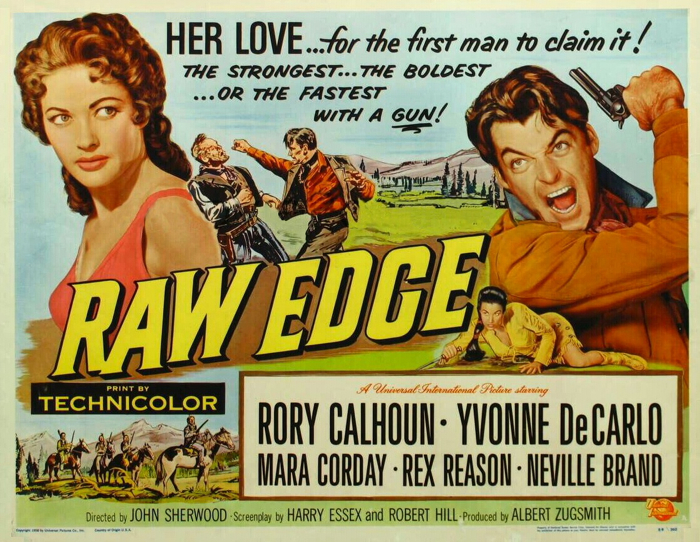 In The Raw Edge (1956), she’s paired with Rory Calhoun, who gave her away at her 1955 Reno wedding to stuntman Bob Morgan in the middle of shooting Shotgun (see inset). 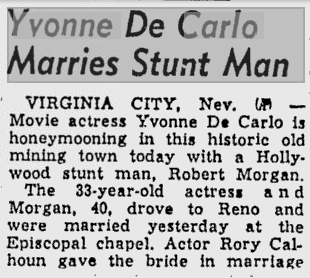 That same year, she’d appear as Sephora in The Ten Commandments. Some of Yvonne’s U-I Westerns are better than others, but you can’t really go wrong with any of them. And while none are available Stateside on DVD, Spain’s doing her proud. Out, or on the way, are Border River (1954) with Joel McCrea, Black Bart (1948, co-starring Dan Duryea and Percy Kilbride) and Calamity Jane And Sam Bass (1949) with Howard Duff. It’s a good start. 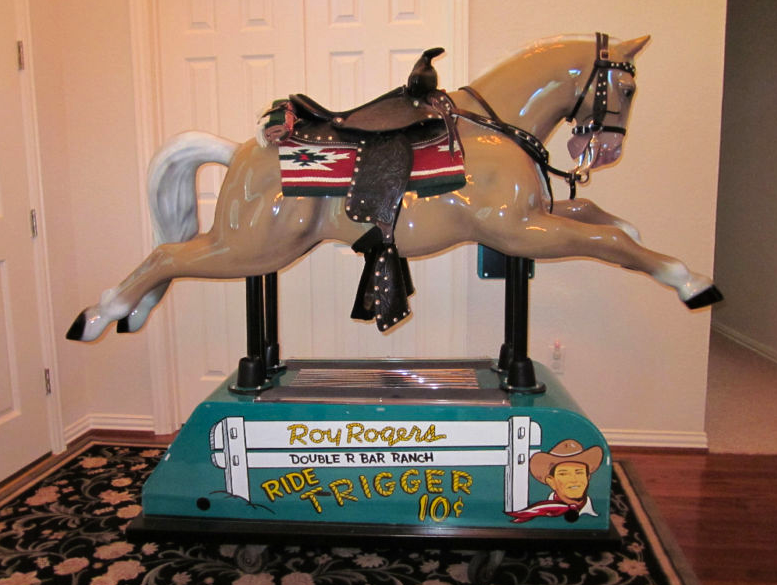 A ride on Trigger’s gone up a bit. The Buy It Now price is $8,500. Leslie Nielsen has passed away at 84. His career is an odd one, almost two careers, going from handsome leads and second leads in serious films (Forbidden Planet and The Poseidon Adventure are two I love) to endearing goofball in pictures like Airplane! (1980) and The Naked Gun: From The Files Of Police Squad (1988). I’m sure there’ll be lots of “stop calling me Shirley” cracks over the next few days, but I prefer the “Is this some kind of bust?” gag. 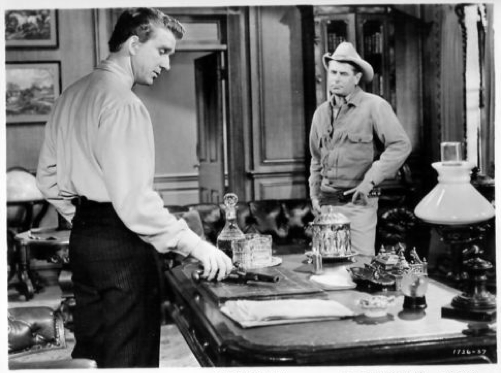 His lone 50s theatrical Western (there was a lot of TV) is a good one — The Sheepman (1958) with Glenn Ford and Shirley MacLaine. So far, two codes have emerged — 25MORE and DVDTALK25. The next wave of titles in Columbia’s DVD-R program has been announced, with release dates of January 2011. 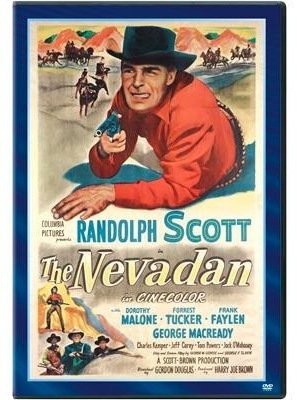 Among the pictures are a handful of 50s Westerns, including Randolph Scott in The Nevadan (1950), co-starring Dorothy Malone and Forrest Tucker. 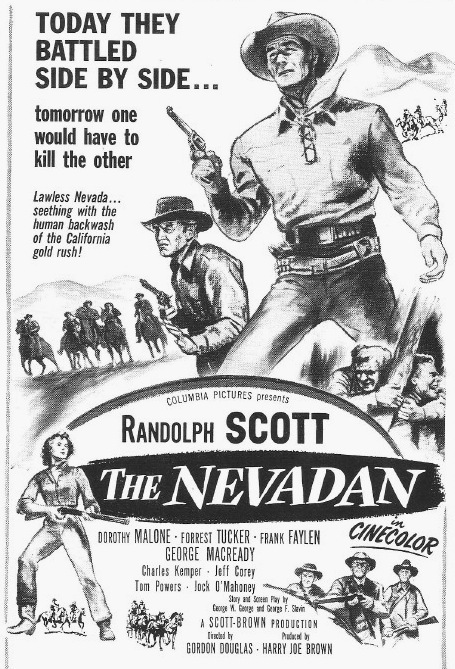 Directed by Gordon Douglas, in Cinecolor, it’s one of the better non-Kennedy/Boetticher Scott-Brown productions. 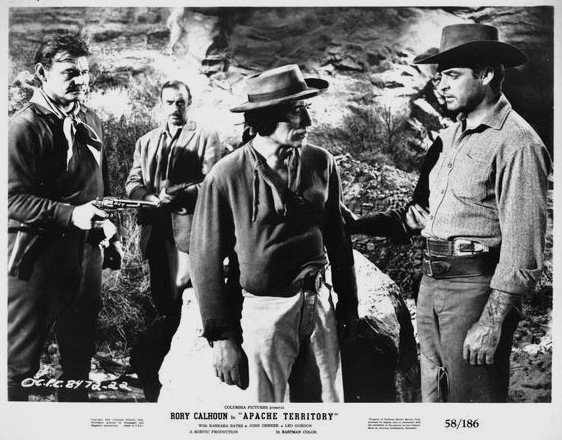 Also coming are three Ray Nazarro Westerns — Streets Of Ghost Town (1950, wth Charles Starrett, The Black Dakotas (1954) and Return To Warbow (1958) — and two from Sam Katzman and William Castle: The Battle Of Rogue River (1964, with George Montgomery) and The Gun That Won The West (1955). You’ll find these already listed for pre-order on Deep Discount. This one may look like a stretch, but it’s not really. 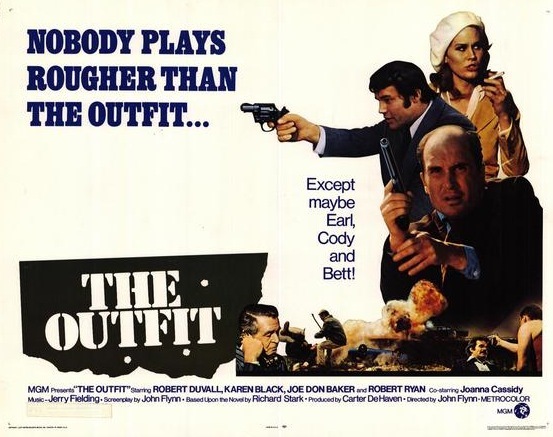 Warner Archive has done us a huge favor by adding The Outfit (1973) to its roster. This tough crime picture, based on a Richard Stark novel (as was the mighty Point Blank) and starring Robert Duvall, boasts a cast full of 50s Western (and film noir) veterans. Marie Windsor (my all-time favorite actress) from Little Big Horn (1951), Bounty Hunter (1954) and others. Timothy Carey of The Last Wagon (1956) and One-Eyed Jacks (1961). Elisha Cook, Jr. from Shane (1953) and The Lonely Man (1957). Those three were all in Stanley Kubrick’s The Killing (1956). Then, for good measure, there’s Robert Ryan from The Naked Spur (1953). That’s quite a supporting cast, folks. It was directed by John Flynn, who also gave us the disturbing, excellent Rolling Thunder (1977, which is also making its way to DVD-R). The Outfit used to turn up on TCM every once in a while, badly needing its 1.85 framing. Warner Archive seems to have taken care of that.